Do you like Jack and the Beanstalk Touch® and everything this game has to offer as one of NetEnt’s most popular mobile casino games? If so, I’m sure you’ll appreciate Halloween Jack Touch® as well. 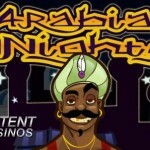 These two mobile casino games have a lot in common and I’m not talking about the theme or design, but about the gameplay. So Halloween Jack Touch® might not deserve the award for originality, but if you prefer a good gameplay over originality, you don’t mind NetEnt reusing the gameplay of one of its most successful games. I’ve been appreciating Jack and the Beanstalk™ ever since the desktop version was launched in 2011 and Jack and the Beanstalk Touch® since its launch in November 2014. The day it was launched in 2011, the game was its time ahead. 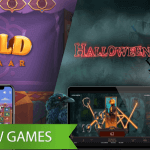 Obviously, if 7 years after the launch of the desktop version, the gameplay is being reused for a brand new Halloween-themed slot. Innovation has always been a priority and will always be NetEnt’s priority. Even if no new innovations have been implemented in this mobile slot, you will be able to enjoy new innovations when it comes to the animations that might result in frightening moments. 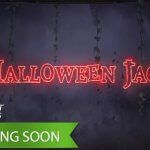 Halloween Jack Touch® is definitely not for the faint-hearted as this game will take you deep within a ghostly, dark landscape! Now it’s no secret anymore that your nerves will be tested. Not only will you be drawn into a series of frightening events unleashed by the girl while all she tried to do is to get rid of the voice within. Therefore, hellish features await you when you decide to play Halloween Jack Touch®. Just like the jewellery box came back, the Walking Wild came back to the reels as if not millions of players have been enjoying this slot feature for years already playing Jack and the Beanstalk Touch®. 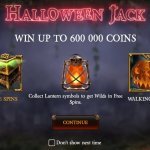 I’m not sure about that jewellery box yet, but I’m rather happy to see the Walking Wild back on the reels in Halloween Jack Touch®. Since Halloween Jack Touch® and Jack and the Beanstalk Touch® share the same gameplay, not only the Walking Wild is back! You get another chance to benefit the Treasure Collection as well, this time implemented as the Jack’O’Lector. For those who have no clue what the Walking Wild is all about, let me explain. Every time a Wild symbol appears on the reels in Halloween Jack Touch®, a Re-spin will be awarded. It’s then that the Wild starts walking to the left until no reel is left. As long as the Wild continues walking, Re-spins will be awarded. Like the jewellery box, the Walking Wild feature keeps on appearing, even during the Free Spins feature. In the end, it seems that you might have a better relationship with the jewellery box than the girl in the story. Voices or no voices, this box is after all responsible for the activation of a true slot adventure. Three or more Scatter symbols appearing anywhere on the reels in the main game will activate 10 Free Spins while there’s the possibility to win additional Free Spins. From the first free spin, you have a chance to unlock the Jack’O’Lector feature. Not a voice within is what you can expect, but a slot feature within a slot feature which can be unlocked by collecting Lantern symbols.